The Honor 7X packs a 5.93-inch screen in an incredibly sleek, compact body. Its size and curved frame makes it a comfortable fit for your hand.Take the lead in games. 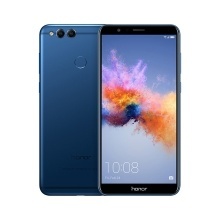 The Honor 7X&apos;s 18:9 screen provides more real estate than a traditional 16:9 screen, giving you a wider view than other gamers.The dual-lens 16MP + 2MP rear camera captures life&apos;s magical moments in the highest definition, empowering your inner photographer.The classic metal design of the Honor 7X is a delight to hold, with its perfectly rounded edge. The 2.5D glass face flows seamlessly into the aluminum chassis. The Honor 7X comes in Blue, gold and Black finishes. Single charge lasts more than a full day thanks to the 3340 mAh (typical) battery and power saving technology enabled by the 16nm Kirin 659 chipset. The Ultra Power Saving Mode extends your charge even longer, keeping you connected. * Big screen 5.93 inch, Resolution: 2160*1080FHD. * Camera: Front 8.0MP+ Dual Rear(16.0MP+2.0MP). * Classic Metal Design, Fashionable and Colorful. * Big Battery: 3340mAh, Long Lasting. TDD: Band 38(2600), 39(1900), 40(2300), 41(2500). Hybrid Dual SIM (Nano-SIM, dual stand-by) – When two SIM cards are used simultaneously, the primary SIM can support 4G / 3G / 2G calls and data while the secondary SIM can support 3G calls only.